At this time of the year, predictions for the new football season are thrown around like confetti but does anyone ever collect them all up, publish them and evaluate them? Here at Scoreboard Journalism, we think that it is important that predictions are published and later evaluated. However, it is also clear that a single season and competition is unfair. Anyone can get lucky (or unlucky) but can they predict consistently well over time, whether that be objectively or subjectively? Therefore, this will be (hopefully) the first in a series in which predictions of final league tables are made and, at the end of the season, evaluated. We begin with the Eredivisie which kicks off on Friday, 2 August. After an appeal on Twitter, I received a variety of different volunteers prepared to predict via objective or subjective methods or a variety of the two. 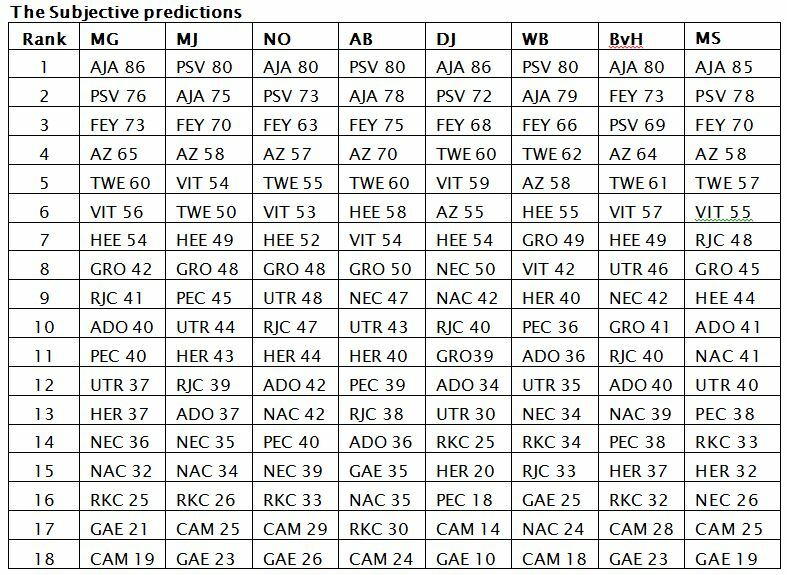 These predictions include one from an expert on Dutch football from the media who will remain anonymous. 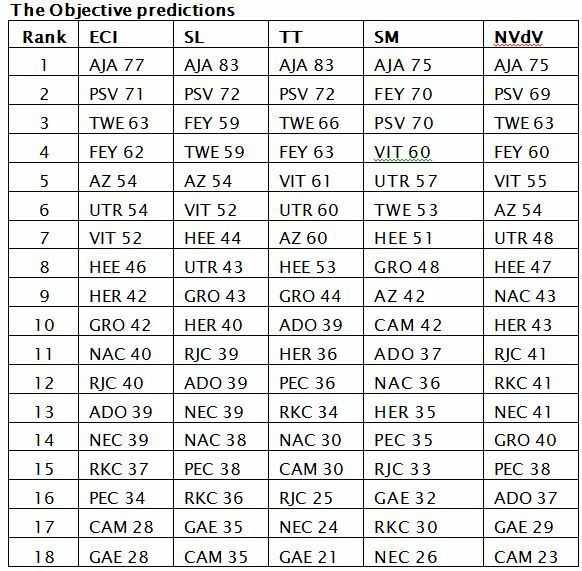 I am hugely grateful to everyone taking part in this exercise and all of their predictions of the final ranking of the 2013/2014 Eredivisie season can be found at the end of this post including the points they have predicted for each club. I have also included the method used, sometimes purely subjective, sometimes objective and sometimes a mixture of the two. We will return sporadically throughout the season to look at these forecasts, and also evaluate at the end of the season. At the end of this piece, there are also four benchmark predictions. The first is simply that all of the teams will get the same points as last season and so, the initial step in being regarded as a good predictor would be to outperform this. The others are based on the idea of the “Wisdom of Crowds”. ECI: Euro Club Index (@euroclubindex on Twitter). Based on results of last four years, weighted for recency. SL: Steve Lawrence (@SteveLawrence_): Based on transfer values of current squad members. TT: Terry Tipster (@terrytipster): Based on team/player strengths. SM: Soccermetrics (@soccermetrics): Based on projected statistical outcomes of current squad combined with Pythagorean. NVdV: Niels van de Ven (@nielsvandeven): Based on goal difference from last 3 years, weighted for recency and transfers (subjective component). MG: A mystery guest from the Dutch sports media who prefers to remain anonymous. Same: Exactly the same number of points as last season. Cambuur and Go Ahead take the points of last season’s 17th and 18th placed teams. Med Obj: The median of the predictions from objective statistical models. Med Sbj: The median of the projections done subjectively. Wisdom: The wisdom of the crowd. The average – again using the median – of all 13 predictions. I may add the mean alternative to this later as a further comparison. I will write a subsequent post before the end of the opening weekend, examining these forecasts in more detail and will return to look at the progress and accuracy as the season goes on. This entry was posted in Uncategorized and tagged Ajax, Eredivisie, Feyenoord, forecast, prediction, PSV. Bookmark the permalink. 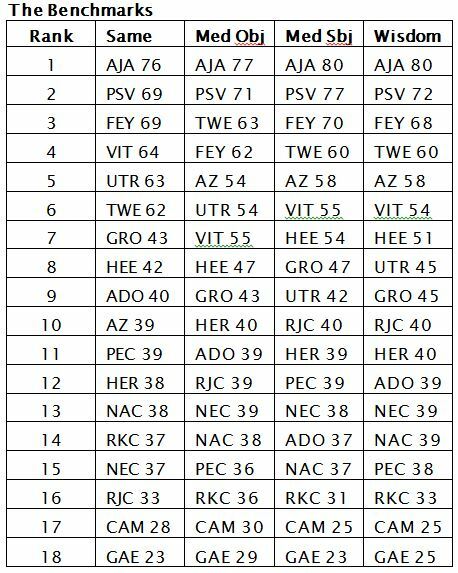 3 Responses to What will the Eredivisie final standings look like?